Sinn's Restaurant in Wembley Square (map) is a favorite for many of Cape Town's inhabitants. I was recently invited to visit to try their R50 spring lunch specials - and oh, what a treat it was! On arrival I was unsure of which dish to try, but Thomas Sinn (owner and, from what I can gather, head chef) had a special smaller serving of five of the six dishes lined up me to try out. 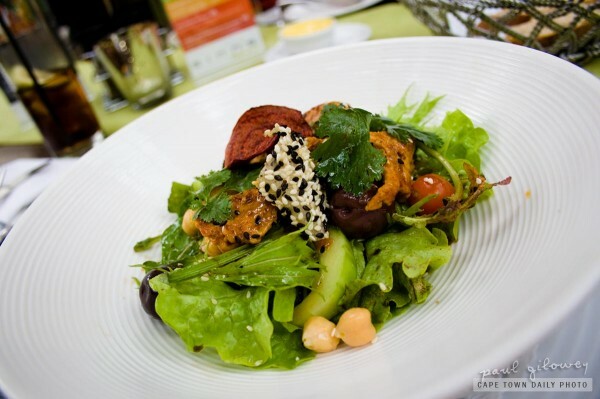 What you see in this photo is the Moroccan Spicy Chicken Salad - harissa-coated chicken with lettuce, chick peas, cherry tomatoes, and a toasted sesame seed dressing. I have to say that it was indeed pretty yummy! Posted in General and tagged restaurant on Thursday, 7 October, 2010 by Paul. I often eat at Sinns and just love this chef’s cooking. i think it makes a huge difference that the chef is the owner – it shows in everything about the food. i also found his special lunch and dinner menus convenient, tasty and inspired. more restaurants should offer this kind of deal. Thanks for the comment Patty. You’re right, I also think it makes a difference when the owner is so intimately involved in the kitchen. Ah man, I so don’t know Cape Town as well as you guys do and it is great to get some insight into these little gems.